Tucked away from sight in far East Gippsland, Australia is a relic of a forgotten time. A time when trains traversed the nation moving people and goods across this huge land that we live in. Twenty kilometres East of Lakes Entrance on the Princess Highway you may notice a sign that says “Historic Trestle Bridge”. Three Kilometres of unsealed gravel road takes you deep into the Colquhoun State Forest. 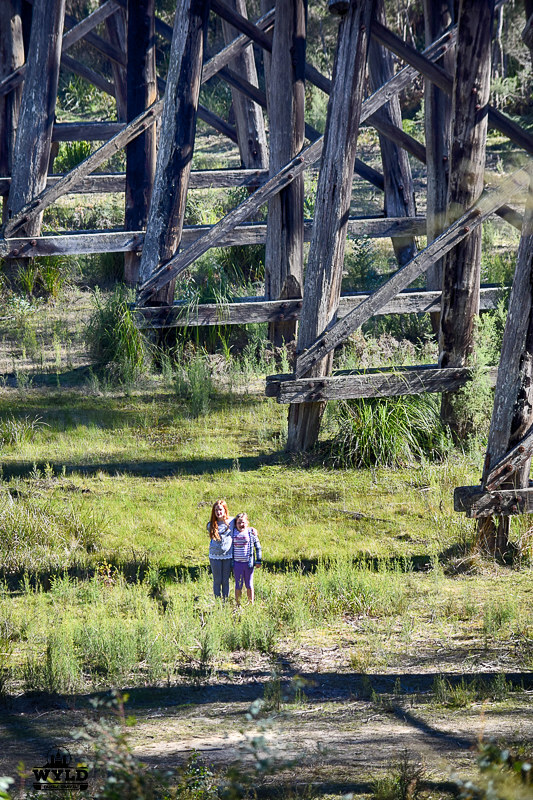 Here you will find one of the most unique Gippsland tourist attractions, The Stony Creek Trestle Bridge. 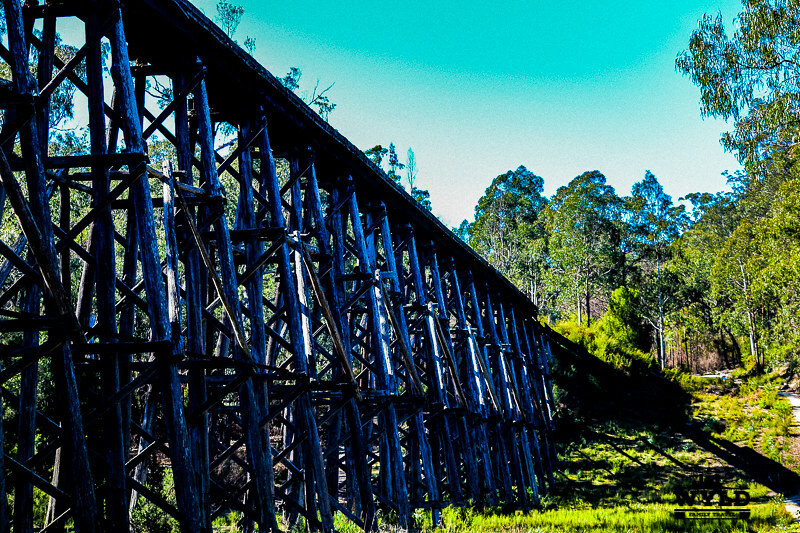 The Stony Creek Trestle Bridge was built in the early part of the 20th century in 1916. The bridge was constructed when the existing rail line from Melbourne to Bairnsdale extended to Orbost. This 97km Bairnsdale to Orbost extension made its way through the rugged terrain of East Gippsland. This section of railway was to have been the most difficult rail project undertaken in Victoria due to the surrounding dense bushland. 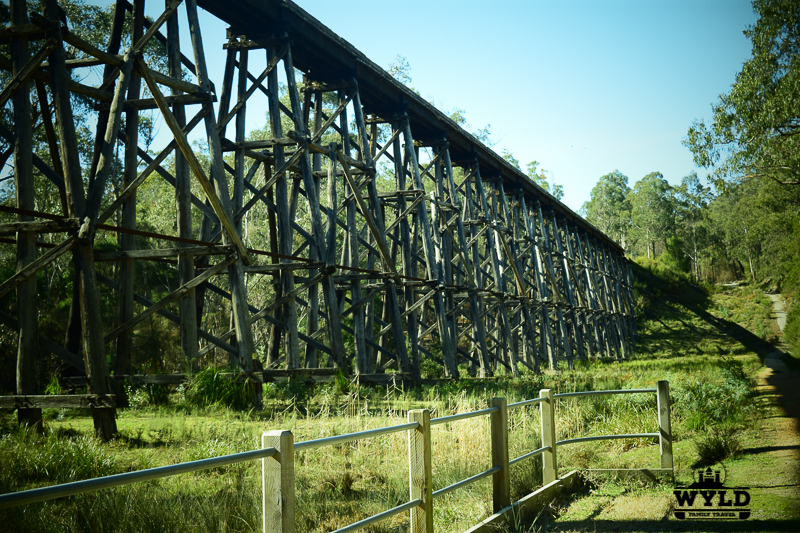 The wooden trestle bridge serviced the line for over 60 years until damaged by bushfire in 1980. The bridge was repaired and the services resumed. Due to high infrastructure costs and low passenger numbers, the last train crossed the bridge in 1988. 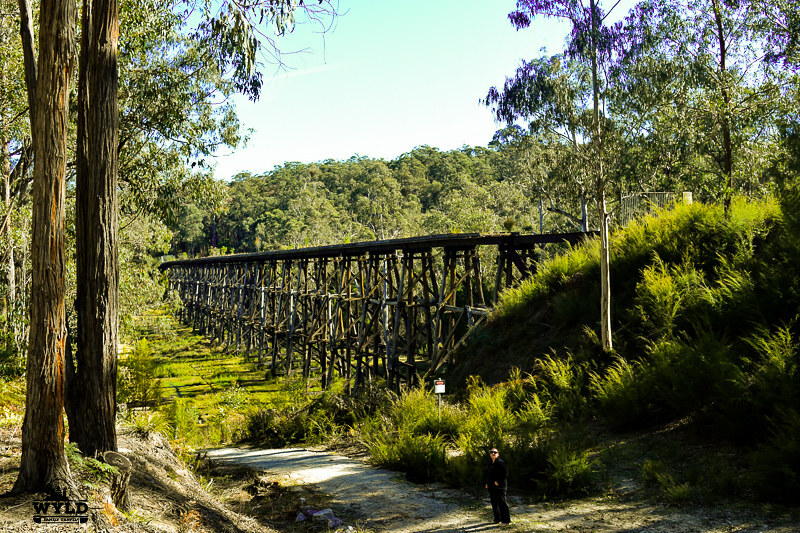 At 247 meters long and 20 meters high, it is the largest standing wooden trestle bridge of its kind in the State of Victoria. The bridge is listed on the Register of Historic Sites. Building materials for the bridge included red ironbark and grey box timber. Stony Creek Trestle Bridge is a prime example of the early engineering. Using skills and practises that utilised the resources and materials found on the site. You will find viewing platforms at either end of the wooden trestle bridge. You can also walk down and view the trestle bridge from underneath. The view from underneath gives you the sense of the scale and height of this relic of yesteryear. Willow and Marley expressed their disappointment that you could not walk over the trestle bridge. You cannot walk on the wooden trestle bridge anymore as its top decking is in a state of disrepair and there are no guard rails on the sides. The top deck is actually fenced off to stop people getting out onto the bridge. There is car parking available at either end of this amazing Gippsland tourist attraction. Toilets are on site and there is a picnic table located just off to the side of the car park. 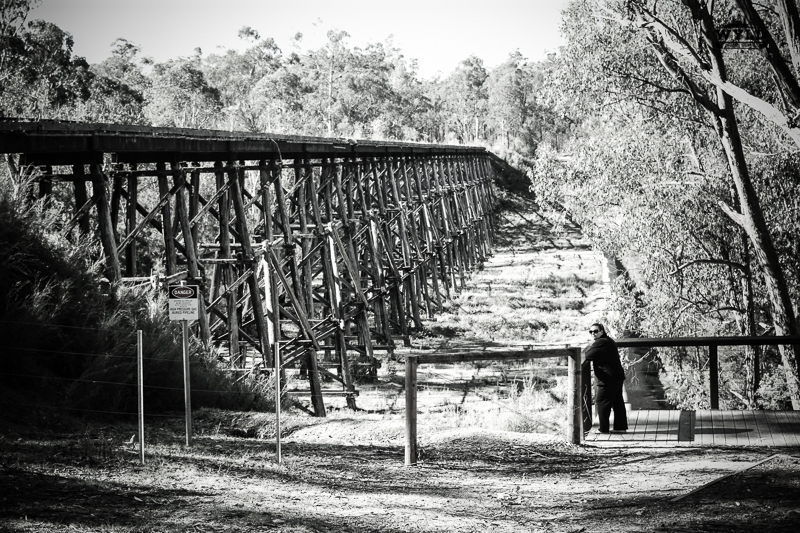 The Stony Creek Trestle Bridge is one of those finds that only happen when you take the chance to turn off the highway, to ask yourself why don’t we follow that little sign on the side of the road? 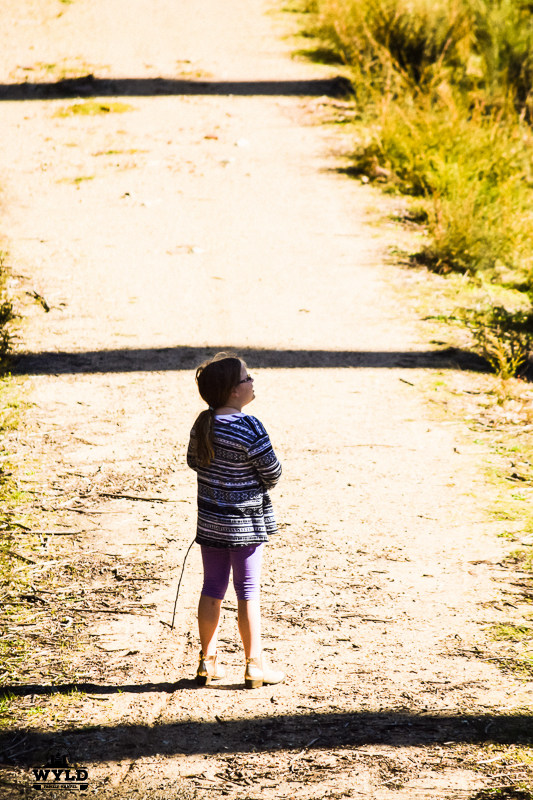 Gippsland is full of little treasures like this waiting to be discovered by you! We love our beautiful part of the state and we have picked these two articles for you to read as well. If you are ever heading this way please stop by them and experience our little areas hidden gems! Love it!!! Have always wanted to visit this bridge! Will have to make the trip soon! Loving the kids on next to bridge for scale. When I think of wooden structures like that, it’s usually roller coasters that come to mind. Thanks for reminding of the true nature. Looks awesome! It’s sad that they closed it down, but then again now you can go visit history! Wow those pictures look amazing! In spite that the last train crossed the bridge in 1988, the bridge looks still in a good condition. Would love to visit it one day. That’s quite a bridge! I’m sure my husband will drool over those photos. As a fan of anything historic that is constructed from timber, he’ll be most interested to learn about this. What a cool place to find! I love trestle bridges. I didn’t even realize how big this one was until your kiddos stepped into the shot. Awesome!! Great information. Australia is an amazing country with so much to explore! The photos of the bridge are beautiful. Too bad you can’t walk over it anymore! Very cool place Mark! It reminds me of a similar bridge near my hometown that my friends and I used to hang out on all the time. What a cool place, I am a great fan of these kind of old bridges and railroads. They have a romantic and intriguing aura around them. Seems like a nice day trip! I always like wandering around old bridges and imagining life back when they were built! These trestle bridges make for such great photos. Your girls are adorable standing under it. In the US, senior graduates often have their class pictures made at settings like this. Your girls look so small compared to the bridges! What a fun way to spend the day and proof that we should all follow those signs on the side of the road lol! Oh wow! Thoroughly fascinating feat. Build in 1916 yet it withstands time and even a bushfire. The structure looks fragile but for something that is a hundred years old, it is not looking bad at all! Loved your blog! Australia is for long on my plans but time and budget have not permitted until now. When time comes your blog will be on the resources list for planning.